From XJTAG 3.6 there is now a range of new options for generating the XJRunner test list automatically, to speed up project set-up time. By default, from version 3.6 of XJDeveloper, when you categorise a test device you will be asked if you would like to automatically add its tests to the XJRunner test list. The tests to add are determined by selecting any functions tagged as a test, using the new XJEaseDoc @testfunction tag. For more information about adding these tags to your own custom device files see the XJEaseDoc help installed with XJTAG 3.6. In the absence of any of these tags, if there is only one suitable function in the test device file that function will be automatically added. Alternatively you can use the new “Suggest Tests…” button on the XJRunner Setup screen to add any tests missing from your project that weren’t added during categorisation. 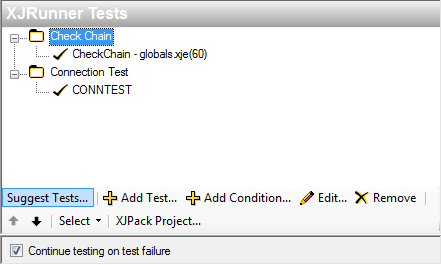 Lastly, to give your test list a head start, in all new XJDeveloper 3.6 projects the global functions CheckChain and CONNTEST will be included as tests automatically. You will still need to define a JTAG chain before you can run them though.